Last weekend’s departure of Alexandre “Kaydop” Courant from Dignitas’ Rocket League team was another unexpected twist in what’s been a wild RLCS offseason so far. Kaydop has played in the last four RLCS World Championship grand finals, winning Season 4 and Season 5 with his ex-Dignitas teammates, Jos “ViolentPanda” van Meurs and Pierre “Turbopolsa” Silfver. But they didn’t win the last one – the dominant squad finally faltered on the game’s biggest stage in November, when Cloud9 shocked the scene by overpowering Dignitas in back-to-back series’ to take North America’s first championship in five seasons. And then they lost again to Cloud9 at December’s ELEAGUE Cup, ultimately finishing 3rd-4th. Given the team’s past dominance, Dignitas seemed like a safe bet to sort through any issues in the offseason and return to their winning ways. Instead, Kaydop left to join French team Renault Sport Team Vitality and play alongside friend and fellow Frenchman, Victor “Fairy Peak” Locquet. 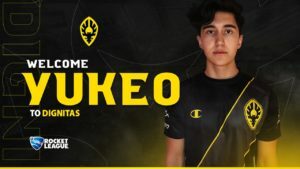 Now, Dignitas has made its own move, signing Austrian player Maurice “Yukeo” Weihs from European rival FlipSid3 Tactics. Yukeo joined in Season 5 as a rookie, with stats site Octane.gg rating Yukeo as one of the top five EU players during Season 6. His addition and growth helped fuel FlipSid3’s resurgence over the last two seasons, and now he’s found himself playing alongside a pair of teammates with five total championship wins between them. Following the announcement, we spoke with Dignitas CEO Mike Prindiville to learn about the team’s big offseason moves and how it sets them up for further success in 2019. Initially with Gale Force Esports, that Dignitas roster had an incredible run over the last year and a half. In addition to winning two RLCS championships and the first NBC Universal Open, they won the European region all three seasons and made the grand finals of several tournaments. It was Rocket League’s dream team, and undoubtedly the most successful team to play the game to date. But after their Season 6 World Championship defeat, Kaydop decided that he wanted to go a different route – and Prindiville says it wasn’t because of the loss. Joining Renault Sport Team Vitality reunites Kaydop with his former Mock-It teammate Fairy Peak, with whom he made the Season 3 World Championship grand finals, plus it teams him with talented young pro Kyle “Scrub Killa” Robertson. Scrub Killa’s rookie season wasn’t a great one for Vitality, which finished 3-4 and didn’t make the World Championship, but the dynamic tandem of Kaydop and Fairy Peak could give them a better chance in Season 7. For Dignitas, it was also an opportunity to shake things up. Kaydop is undoubtedly one of the world’s best Rocket League players and an incredible offensive force, but Prindiville said the opportunity to start fresh in 2019 was a welcome one. In short, he sees it as a mutually beneficial move. Yukeo came out of nowhere to fill FlipSide Tactics’ roster opening for Season 5, putting up a solid rookie effort, and then really turned it on last season to elevate the team to a 5-2 finish. He also scored the winning zero-second goal (below) that returned the organisation to the World Championship, and continued to play well at the finals in Las Vegas. Francesco “kuxir97” Cinquemani has been the one consistent rock for FlipSid3 Tactics throughout its six seasons, including the Season 2 championship win. His offensive surge secured him the regular season MVP honours last season, but Prindiville suggests that Yukeo – one of the rare keyboard-and-mouse players in the league – was starting to take over that title of the team’s most dynamic force. Even so, Yukeo has significantly less RLCS experience than Kaydop, and no championships to his name just yet. He’ll have to get accustomed to two brand new teammates, and they’ll have to learn the tendencies of a fresh third. Dignitas’ strength has always been incredible game sense; they didn’t play flashy, but all three teammates were incredibly capable and almost preternaturally aware of where their partners were located. Working Yukeo into that style of play could take some time. It’s a fresh start for this Dignitas team, and we won’t have to wait long to see the results in action. 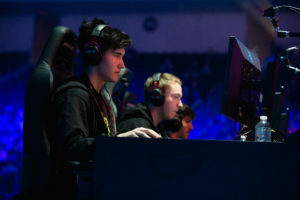 They’ll play at the $100,000 WSOE 4: The Rocket League Showdown tournament in Las Vegas next weekend, with FlipSid3 Tactics also competing with Red Reserve’s Jack “Speed” Packwood-Clarke as a temporary stand-in. Dignitas’ success had previously seemed so effortless as they dominated the pitch, but between a new member and the rising tide of talent across both the region and the league, they’ll have to put in a lot of work to remain atop Europe. Prindiville knows this.